Full disclosure: I was given a complimentary ticket to this event by the organizer. The review is based on my own experiences as well as those observed of others who were there. The Sailor Moon Pop-Up Cafe in Toronto happened yesterday at Hirut Cafe, who may now be regretting getting involved in a first time Sailor Moon cafe event as some disappointed attendees have been giving the restaurant negative reviews for an event that was run by a separate group. I arrived shortly after 3pm and I saw a long line of attendees forming outside. On a hot summer day, I was hoping that people weren’t waiting long and that they would soon be ushered inside to be seated. I went inside (it was difficult to identify who was working for the event outside) and I asked to talk to the organizer. I skipped the line as I was personally invited and I wanted to speak to the organizer. I also have an invisible disability which would have made it problematic for me to stand outside for a lengthy time (I can only walk/stand for a limited time per day). I was directed toward the back of the front level and I spoke briefly with Deborah, the head organizer of the event. She recognized me as the chair of the Toronto Sailor Moon Celebration and said that she was glad that I could come but that they were already running about an hour behind schedule and she was already expecting to receive bad reviews. She also said she had been delayed getting to the event because of Caribana and that it took her nearly three hours to get there in a taxi (which I’m sure only left her stressed at the beginning of the day and it can be challenging to make up for that). She encouraged me to find a seat anywhere to be served. I noticed that there were a few people behind the counter slicing strawberries for the parfaits and scooping the mango ice cream into glasses for the parfaits. Since I have a family member who works in the restaurant industry, I thought it odd that the strawberries hadn’t even been prepared in advance. It’s generally best to do prep cooking in advance so that it’s quick to assemble things for serving. The staff all appeared stressed and flustered and encouraged the organizer to cut one of the drinks so that they could switch to the next group of attendees sooner (not a good sign). I walked around the place which had sparse party decorations. Near the front door there was milk and cream for coffee and tea, which is not really a good idea on a hot day. Another set was downstairs on a high table too. I set down a stack of flyers for the picnic I’m running next weekend at Kew Gardens near the front door and I made my way down the stairs, which had some simple homemade decorations and ribbons hanging down from the ceiling. At the bottom of the stairs was the first vendor, Maho Girls, who had also exhibited at the Toronto Sailor Moon Celebration. She said she had limited stock, but it seemed a good variety and quantity of items for this event. The featured artist of the event, Marie Jane Works, was also downstairs, around the middle of the space on the right side, in an area that looked like a smaller bar with an L shaped counter. She had a selection of prints and some original artwork for sale. It was a mixture of Sailor Moon and other pieces. She was also cosplaying Sailor Jupiter, which was a nice touch. Random j-pop music was playing on the speakers downstairs, too bad it wasn’t exclusively Sailor Moon music and too bad they weren’t also playing upstairs. No music would have been fine too, it just seemed like a missed opportunity. At the back of the lower floor there was an area set up like a photo booth with a sign written in marker that photos were $5 (this was later reduced to $4). There was a young woman cosplaying Princess Serenity nearby, and presumably she was there for you to take photos with her. There was another young woman there to take the pictures with an instant camera. Both of them looked permanently miserable. This corner was also quite dark and not properly set up for photos. It seemed unreasonable to be charging people $5 for a small picture in a dark location and then the people who were part of the photo booth looked like they were unhappy about being there most of the time. Needless to say, very few people took pictures at the booth. There was a raffle prize given out around this time, one of the attendees received a Proplica moon stick. I never saw anything about where people would get raffle tickets before or after that and I didn’t see any other raffle items given out. I’m not sure if this was only something offered to a certain time or what. 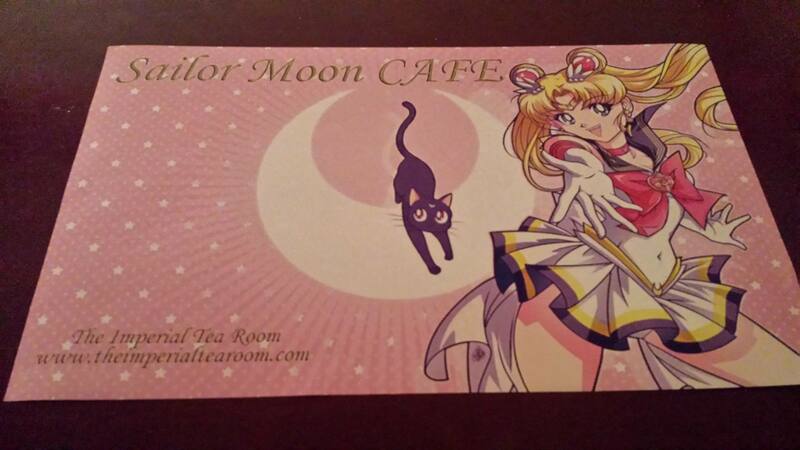 A little while after, a staff member cosplaying Sailor Moon brought coffee to the table next to me and asked about tea for that table and mine. I requested tea. I received one of the cookies that had a more detailed icing design, but I saw others received simpler designs with senshi symbols on them. There was also a blue cupcake that some received instead of the green. The cookie was a simple sugar cookie and the cupcakes had a slightly tangy icing (I’m guessing a cream cheese icing). At this point I was glad I brought my own water bottle because I hadn’t received any kind of beverage yet, which doesn’t mix well with this kind of food. The staff member cosplaying Tuxedo Mask brought me a parfait soon after as I didn’t have a drink but the table next to me did. The parfait had a mango sherbet, sliced strawberries, blueberries, and chocolate pieces. I suspect it was supposed to have whipped cream on top, but it started melting before it got to me so it was hard to tell. Around this time the Sailor Moon cosplayer started checking to see if people wanted water, but she repeatedly came downstairs without much water in the jug and with too few cups to be able to accommodate everyone on that level. It took a few times before she grabbed a larger stack of cups and two jugs of water so that it would be easier to serve people. The staff were mostly friendly, but they all seemed frazzled and stressed. They were constantly rushing to try to take care of everyone, but they hadn’t planned out who was taking care of which table or when they were serving things so it was a bit chaotic. 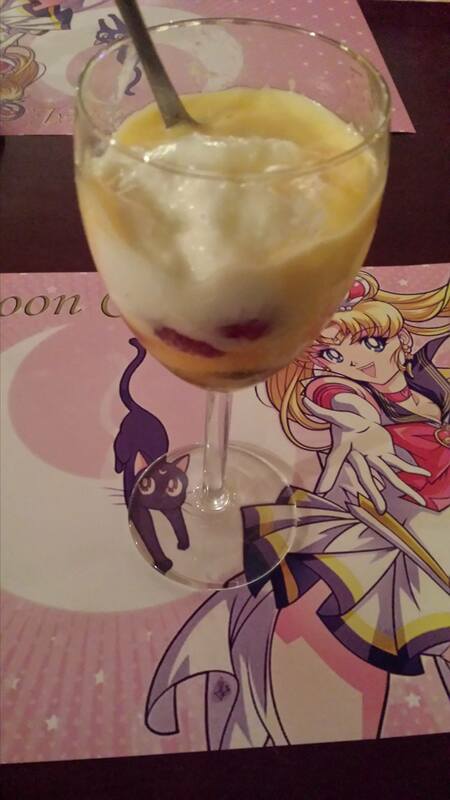 The Tuxedo Mask cosplayer asked me what I was waiting for when I had finished the cookie, cupcake, and parfait. I mentioned the tea again (I think this was the third time), and he said he’d go look into it. After waiting a little longer I decided to leave as I was taking up a table that could be occupied by other attendees instead. I was there about an hour and had requested the tea early on, it seemed strange to offer something they had difficulty providing. On my way out, the Tuxedo Mask cosplayer apologized about the tea. I said I’d been waiting an hour for it so it didn’t make sense to stay longer. I picked up my flyers and went out the door to still see a long line of fans waiting to get in. Many seemed disappointed and I decided against handing out flyers to them as they mostly seemed upset and I didn’t want that to be associated with the casual picnic I’m running. All in all, I think the organizer and staff were very unprepared for the crowd and were inexperienced at serving this number of people efficiently. Deborah, the organizer, was apologetic from the beginning and tried to make do the best she could, but was clearly not ready to handle this amount of fans and not enough food was prepared in advance. They also mistakenly assumed that back to back time slots would work and didn’t give themselves a buffer for clean up and switching to a new group of people, which only encouraged delays. Prep more food in advance — all chopping for starters and portion sizes should be decided so that they can be dished out consistently. Make sure you have enough food based on the number of tickets sold, in fact it’s best to plan for extra so you don’t run out. Don’t leave milk/cream out all day, especially when they aren’t in chilled containers. People can get sick from this unless you use shelf stable milk. Chilling disposable containers of milk/cream would be better for maintaining temperature and could easily and safely be distributed as needed. There are chilled containers you can get for milk/cream too, but I wouldn’t recommend that in the summer. Clarify to attendees that it is a one hour sitting time per ticket, there seemed to be confusion on the event page and quite a few people lingering in the cafe who might have otherwise left a bit earlier. Have a buffer time between sittings so that there is time to clean up and stay organized between groups, this also gives you a bit of time for overflow for attendees who might linger. Consider staggering seating times to make it easier to serve sections instead of trying to serve a hundred people at a time when you don’t have enough items prepped. Have staff dedicated to serving specific tables. They were constantly running around and looking panicked because they couldn’t keep track of things. If you do co-op serving, make sure there is a way to communicate who has been served what — maybe have a white board for the staff to use so they can check things off per table. Have more staff serving items and have them be clearly identifiable — cosplay is not enough as some attendees showed up in cosplay as well. Name tags or badges would be great. Have a few dedicated staff outside giving water and/or juice to the people waiting outside so that they don’t dehydrate (this will also put them in a better mood when coming in). Someone should also be checking for people with disabilities that aren’t immediately apparent so that they aren’t standing outside as long. Have someone paying attention to the door so you know why anyone is bypassing the line. Have some kind of activity that encourages people to interact beyond their own table — many people were keeping to themselves but it would have been easy to encourage people to talk to others. I was there alone, but nobody was ever seated with me which seemed odd considering the limited space. Don’t provide things that are difficult to offer in a timely fashion. If coffee and tea are too challenging to provide consistently, don’t offer them at all. Giving to some and not to others is unbalanced and leaves some people feeling they are missing out. In general, offer less food items and make sure they are easier to prepare and serve. Melted parfaits and missing ingredients quickly disappoint paying attendees. If you’re going to have a photo booth, have it lit properly and allow people to take pictures for free on their own devices. Charging for photos should be only on a more professional level, with proper lights and a backdrop, plus the digital file emailed to the payee. Vendors in the lower level seemed like bad placement for them to get traffic. Hardly anyone went down who wasn’t seated on that level already. If you’re going to have music, random j-pop isn’t really a good choice. There is a lot of Sailor Moon music that could have been used instead. Also, the music would be better to play everywhere, not just on one level. This venue was small and not easy to navigate for the staff of this event. A large party room at a bigger facility would have been easier to coordinate. Consider catering most of the food and drink items and then have the cosplay staff there mainly as greeters and for taking pictures and mingling with fans. I thought the food was pretty good, and I don’t mind that my parfait was a little melted. But, if I were a paying customer I would have been disappointed about not receiving the tea or “senshi drink” that were advertised and would have likely considered either requesting a partial refund or hesitated about going to a future event until the bigger issues are worked out. I think that this type of event has great potential, but it is challenging to pull off the first time especially if you are inexperienced with handling a crowd of that size. I hope that another event like this happens in future, but with more planning and perhaps cutting back how many items they serve to customers until they can handle serving all customers consistently. It’s too bad this didn’t go very well, because I got the impression that Deborah and her team really wanted to create an enjoyable experience for Sailor Moon fans. Here’s to hoping that they can regroup and try again with a bigger team and more organized planning. Kaerenmama’s Sailor Moon Charaben Recipe! This was too irresistible not to translate – I have done something different though. I have not translated the steps word for word, but instead combined her ideas with helpful hints on how to do this on your own. This is probably a little more effective for those of us who have never made a charaben before to try! She also has a post on her own blog with the recipe. She also has a post about the event itself, but no photos of Naoko :(. The photos on the ANIMAX page basically show daughters working with their mothers to assemble the bentos. I have included the Japanese names of as many of the ingredients as I could. Before I go on though, here’s the copyright warning. All Images Below are property of Kaerenmama, Foodies TV, and ANIMAX. These are solely being used for non-profit purposes, only to educate English readers about how to make these lunches! (たらこ) Tarako – called “Cod Roe” in Japan, but it is really Alaskan Pollock roe (fish eggs). Roe can be used as a filling raw in Japanese cuisine, or if you want you can add a little soy sauce to it (but use a low sodium soy sauce because Roe is very salty). Cupcake/Muffin Baking Cups (they have silicone ones, but you could probably get away with using 3-4 stacked together to hold the rice, or better yet see if you can find the foil kind). (包丁) Houchou (Big Chef Knife) (to cut off the edges of the egg sheet that might be too thin). Step 1: Form your rice into a ball (onigiri) and use the plastic wrap to help set it properly. Squish and shape it between the palms of your hands until you have a ball that is big enough to fit in the baking cup. If you decide to use Tarako, Kaerenmama suggests to grill it to your liking for this recipe. Form a deep dent in the rice ball, and put some of the roe inside using a spoon. Then squish and shape the rice between the palms of your hand such that the rest of the rice completely covers the filling and you have a perfectly shaped rice ball! The plastic wrap will help to keep it in shape, and also to store it for later. Step 2: Using the stencil found here (we have posted it below), and the pop bottle cap, cut out two circles for her odangoes, her ponytails, bangs, and tiara out of the egg sheet (usuyaki tamogo). Note: in one of the videos, she also uses the bottle cap to make moon shapes (pictured to the right, sorry about the terrible image quality). Cut out a circle with the bottle cap, and use your tweezers/chopsticks to pop out the circle. Then cut out another circle in that circle about a third of the way through the shape. YOU HAS A MOON! Step 3: Onto the crab or carrot sticks! Using your straws, use your biggest to make Usagi’s red hair gems, your smallest to make her tiara jewel (the end that is not slanted), and the slanted end of the smallest one to make her mouth. Step 4: White cheese slice of some sort. Could be swiss, could be aged cheddar, the fan can decide. Using all three of your straw sizes and the straight ends only, cut out two shapes for each size (these will make her eyes). Step 5: Cut out two small circles that will fit just inside your biggest cheese circle with the scissors from the nori. Kaerenmama suggests folding the sheet in half and then cutting out your circles so they are both the same size. Step 6 + 7: Using your hands, first tuck in the ponytails behind the rice ball on one side, and then the odangoes overtop. Add Sailor Moon’s red hair accessories, then place down her tiara, jewel, and finally, the bangs. I suppose you could do the mouth now (with clean tweezers or chopsticks). Step 8: The eyes are a little tricky and you will need to use tweezers – first, down goes your biggest cheese rounds, then the nori circles overtop. She went a step further later and suggested to cut out eyelashes, but this is completely up to you. Then comes your 2nd biggest cheese round, centered on the nori, and the tiniest goes to the bottom side of the round – just for that extra glare! If you have not set in her mouth, now is the time! Step 9: You’re done! Fill your bento with whatever else you would like to – to create other shapes, you can actually go to the craft store and find single hole punches in different shapes. You can use these to cut them out of thin sheets of nori, vegetables, cheeses, colored tofu slices, or meats! Be creative! Hers showed a mini salad with flowers made from (I think) thin ham or salami ribbons. Mini cookie cutters also work well too. Another variation she shows has “Usa” over top and fried chicken wings, mushrooms, potatoes, and steamed veggies. She uses small pieces of bamboo skewers (you could probably get away with toothpicks) to hold everything in place. Here again, are the images we posted before so you can eyeball your way around, and the variation. 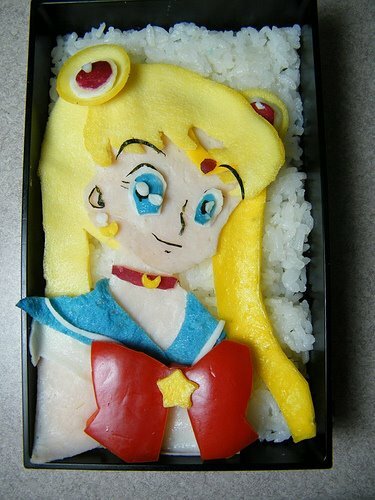 You can probably make the whole Sailor Moon by cutting out shapes from the meat and nori, and using very thin ribbons of the egg sheet or cheese for stripes. 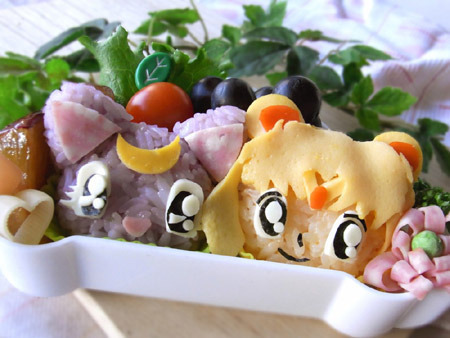 And, if you want to make Luna, I am assuming that her rice just has some diluted purple food coloring (blue + red) and has mini triangular rice balls for ears. I’m tempted to try a variation of Sailor Moon using eggs, toast, and omelet veggies for breakfast. If and when I have the time to attempt this I actually do succeed, I will post pictures :). 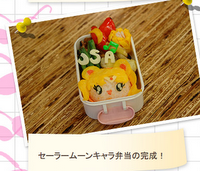 Fans you are also welcome to send in your Sailor Moon Charaben experiments and they will be featured on our site! BREAKING NEWS: Naoko Takeuchi makes appearance at Charaben Class! Since last January, we’ve been covering a second special event ANIMAX had planned in alliance with Foodies TV of Japan to celebrate the return of Sailor Moon. The special class came and went on February 7th, with barely a whisper. 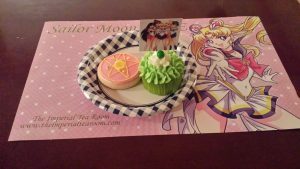 Hours ago, a press release and news article finally made it to the media, and revealed some details about what is possibly the most interesting event we’ve ever learned of related to Sailor Moon! Speaking of which, there may be a glimpse on the videos provided on the special site, except that they are too big (and too slow) to load. The site features instructional videos on the bento, and we warn our readers that these videos are 200 and 400mb in length, and they are only being transmitted at a speed of 20k/s if you are lucky (and we’ve been trying to watch these over a high speed connection). As soon as these get loaded (possibly by tomorrow) we’ll try to (as soon as we can) tell you what else is on there. ANIMAX and Foodies TV, in conjunction with Japan’s Edu magazine, are holding a contest for children to create their own Sailor Moon bento. Kids can send in their entries between March 1st and 30th, and 3 winners will be announced by Foodies TV, and they will get a feature article in the July issue of Edu. 10 winners will win both of the Season 1 boxsets, so those who don’t make it into the top 3 still have a chance to win something amazing! For more information, click here! 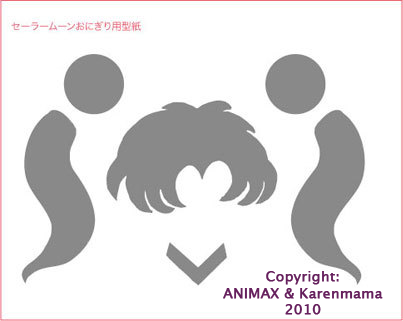 Please check out the special site that ANIMAX created with a report of the events. Even if you can’t cook, the images posted are absolutely beautiful to look at! The press release at Presepe.JP ended best when it wrote (roughly translated) Let’s all put our love for Sailor Moon into the Charaben! We can’t put this in any better words – if we all had the opportunity to make these charaben, there isn’t a fan that wouldn’t put their heart and soul into this! 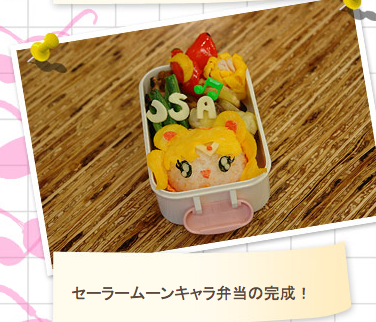 BREAKING NEWS: First Look at Sailor Moon Charaben! 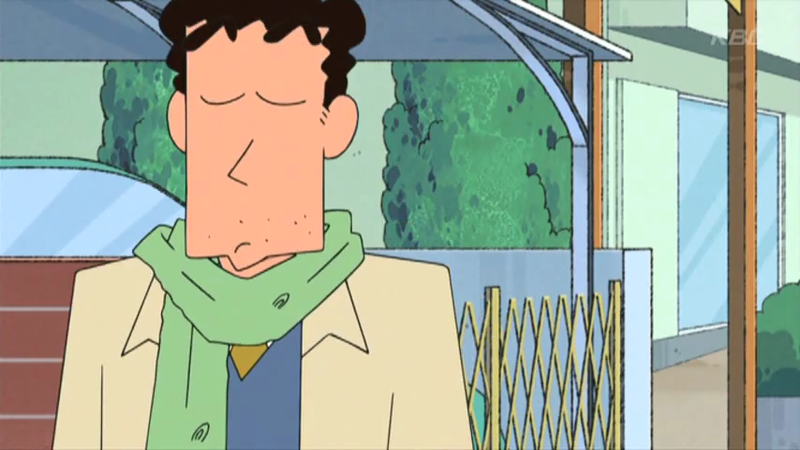 **”Charaben” is an amalgamation between character and bento and is used frequently in the Japanese language (before you ask us what that word means). Literally just minutes ago, this article was posted for release to the news media providing more details about the venture between ANIMAX and Foodies TV in Japan, teaching kids how to make character bento meals. We are all loving these pictures right now and are really wishing there was some way to watch this channel! On February 7th, Kaerenmama (real name, Kyoko Sugawara) is going to show kids on Foodies TV how to make these bento, as well as teach them something about proper nutrition as well. There will be a special taping where 40 viewers will be invited to watch, sponsored by Tokyo Gas. In true Sailor Moon style, viewers will once again have to enter a lottery to win one of 20 pairs of tickets (each network is offering 10). The special will be aired on both ANIMAX and Foodies TV throughout the month of March. 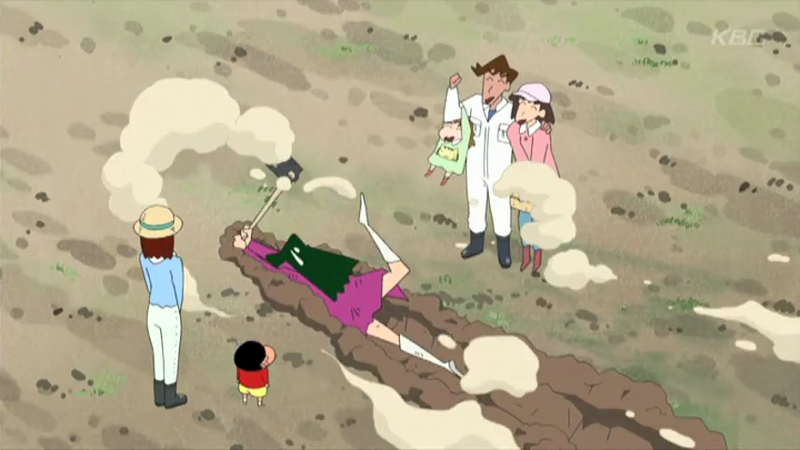 We wonder if Kotono Mitsuishi’s (Sailor Moon) daughter will watch this with her?! Moreover, the two channels have announced a competition where children can also submit their own bento recipes for a contest. The winner will be announced on May 18th in Shogakukan’s child-rearing magazine, edu. Looking at these pictures alone, it looks like fans have yet another reason to be jealous of Japan, again. We wonder if a Sailor Moon cooking special could ever thrive in the English TV market?